A slim, rangy man, about my age sat at the table next to ours. 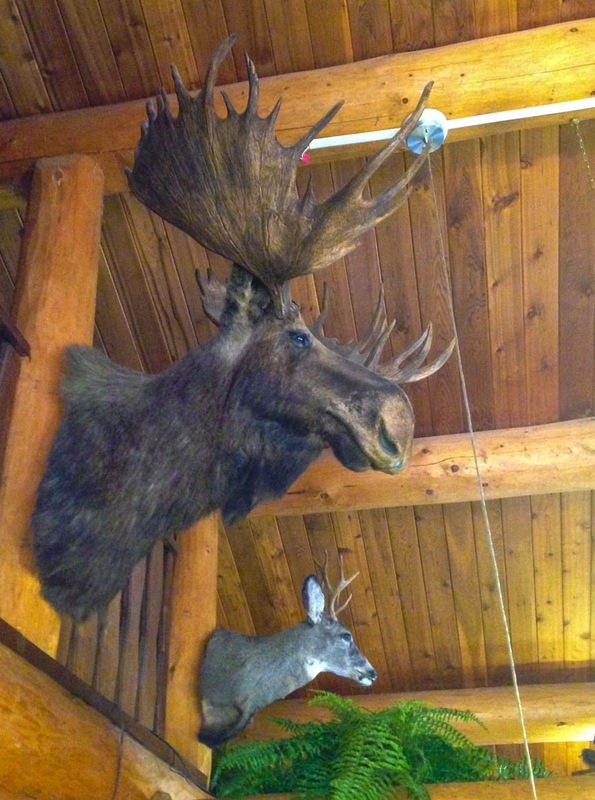 The North Country Inn is a German restaurant in a log house with a large stuffed moose on the wall. As soon as I sat down I decided I'd ask for bauernfruhstuck. The waitress stared at me blankly. Farmer's breakfast, I translated, Ach! The farmer's breakfast, ok. Her accent was heavy enough that I asked her where in Germany she was from. No, I am from Quebec, she said, I only work for Germans! Duh-oh! The gentleman at the next table said, I gather you speak German after the way that you so clearly asked for the bauernfrustuck. Flattered, I admitted that I had spent time in Germany many years ago, but that my command of the language was poor then and worse now. Lothar introduced himself with an authentic German accent and asked if he could join us. He had moved to Canada from a small town near Munster almost 30 years ago. Then as a mining engineer he had explored vast areas of western Canada, but now works as an agricultural insurance claims adjuster. There is a lot of land clearing around Vanderhoof and we learned that most of it is used for growing hay and, that while the growing season is short, the days are long and crops grow quickly. Our engaging discussion was wide ranging and covered everything from fear, avarice and the inevitable ascendency of women to power as a positive thing. Eventually, we pulled out our AAA map of British Columbia (Google maps is really useless at providing a big picture) and Lothar helped us with directions. Then it was time to ride. The desert valley had long since given way to thick woods and rollling hills that opened out into farmland hewn from the forests generations ago. The road ran alongside rivers lined by poplars and at times we could see clearly for miles. At one point the sky off to our left was thick with smoke from a massive forest fire that posed no imminent danger to us. 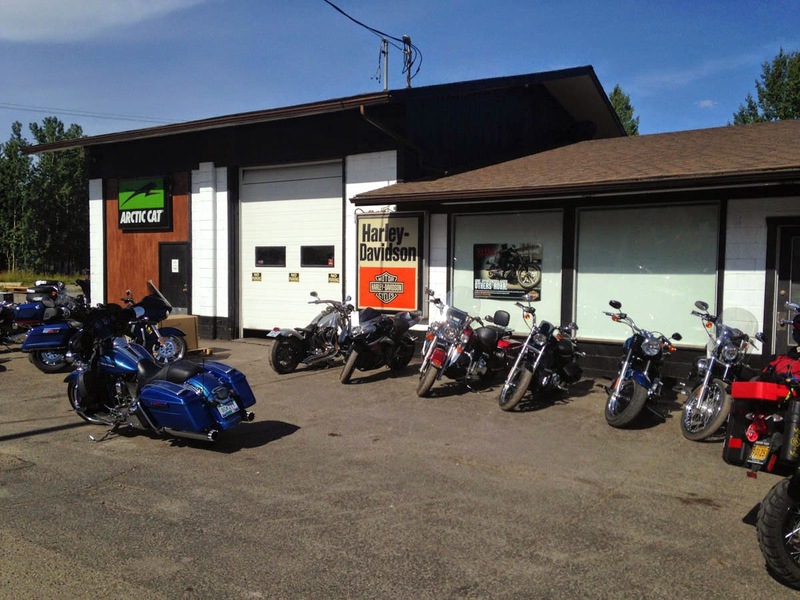 Passing through the tidy town of Houston, with it's giant flyrod statue, we finally stopped in Smithers at the Harley Davidson dealer for some advice. Tiger Lily's front end was prone to bouncing and it was getting progressively worse, so I asked the service guy, Mike, if he'd be willing to look at it. He said he would, but not for a couple of hours and we went off in search of lunch. We eventually found ourselves at the Mountain Eagle Bookstore, drinking lattes and browsing dozens of local music artist's CD's among the energy crystals and handmade jewelery. Smithers is kind of a happening place, a last stop winter sports/summer artist's enclave before you hit the wilderness. Back at the Harley dealer, the culprit proved to be a poorly worn tire, nothing more sinister. But with no spares in stock, it was time to press on. And on we pressed. The Stewart-Cassiar Highway is a favored route for those heading to Alaska on two wheels and soon we were embraced by its lush undergrowth and bear-lined verges. Daylight was drawing to its languid close. The mddle of August still had long sunsets that meant the likelihood of a deer or moose or bear wandering in the gloaming and across our path was much greater at this late hour. I rode with caution - and let Sledge take the lead. Just as it was getting really dark we reached Mediazin Junction and our first campground. We had big goals for the morning and hit ground with a thud. I feel I am reading a old travel log. I now have to sit and wait for next issue. Hey! Hey! Hey! It's Prudhoe Bay!